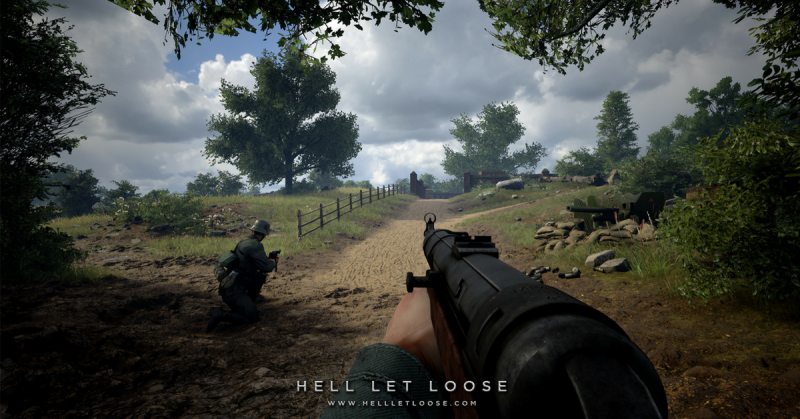 Developed for PC in Unreal Engine 4, on paper, Hell Let Loose is a realistic multiplayer World War Two combined arms first-person shooter of open battles of up to 100 players with infantry, tanks, artillery and a shifting front line. At it’s core is a unique resource-based strategic meta-game that is easy to learn, but hard to master. Featuring sweeping 4km2 maps, the battlefield is divided up into large cap sectors – allowing for emergent and constantly unique gameplay that pits two forces of fifty players in a fight to the death across fields, bridges, forests and towns. The first theater of war is the sleepy Norman town of St Marie Du Mont on D-Day 1944 in northern France during Operation Overlord. It features a stunning and detailed 1:1 scale battlefield recreated from archival reference material and satellite photography. Players will organise and muster behind the front lines before carefully pushing forward into the French countryside towards the town. They will need to establish supply lines using logistics vehicles – enabling them to build Garrisons and other spawn locations in the field. Engineers will lay minefields and barbed wire to create choke points. Sunken lanes become killing zones while dense woodlands could mask the presence of a devastating PAK 43 – towed into position by a waiting unit of Wehrmacht infantry. Allied infantry call in strafing runs as hedgerows light up with the fire of a Panther tank and the scream of the Hitler’s Buzz Saw – the MG42. The battlefield is laid out – ready to be mastered by soldiers with the skill and strategic ability to wipe the enemy from the field. The plan is to release Hell Let Loose on Steam in Q2 2018. HOW MUCH IS HELL LET LOOSE & WHERE CAN I BUY IT? Hell Let Loose is scheduled to release in Early Access in Q2 2018. WHEN WILL HELL LET LOOSE BE RELEASED? As a small team, our entire focus is on delivering a polished PC title with a reliable and bug-free user experience. While we will explore the possibility of a console port, we feel it is irresponsible to promise a console title at this stage of development. WHEN IS HELL LET LOOSE SET? We plan to create many more theaters on full release – allowing players to fight in iconic conflicts such as the Battle of the Bulge, the Battle of Stalingrad and the Battle of Guadalcanal. We are also keen to include the community in our decision-making process when it comes to the creation of additional theaters. WHICH FORCES CAN I PLAY AS? Initially, the first theater set in Normandy will pit the faded might of the German OKW against the relatively green forces of the United States Army. We plan to make more factions available as we create different theaters. HOW REALISTIC WILL IT BE? We’re aiming to make a game that mixes the high-intensity carnage, weapon mechanics and brutality of Red Orchestra 2 with the operational, supply and construction mechanics of Project Reality beneath the meta strategy of a game similar to Company of Heroes. We prefer intense, terrifying and intelligent instead of long, tedious and boring. WILL THERE BE DESTRUCTIBLE ELEMENTS? At present, bridges, walls and fences are at the top of the destruction priority list, as this will have a significant effect on gameplay, strategy and tactics. Players will be able to shape the flow of traffic across the map by making areas very difficult for armor and vehicles to traverse safely. We tested numerous forms of more complex destruction for both foliage and buildings and decided that the load on the network would compromise the total player count of the game. It is more important to us to field 100 players on a large map, than 5 players on a destructible battlefield. Yes. We already have appropriate decals, death animations and blood spray, but we’ll be looking to drive the horror home with dismemberment. The Medic role will play a vital part in dragging, carrying and reviving wounded comrades. We’ve built a three-tiered system of wounding that reflects the reality of the conflict without bogging the player down with tedious and often contrived mechanics. If you take a shot to the extremities, you’ll be able to deal with it yourself. Getting hit in a vital area will require some professional attention. Getting hit by a mortar round or throwing yourself onto a grenade will turn you into Humpty Dumpty. Vehicles in the game will be equipped with historically accurate gunsights and levels of magnification. They will have finite ammunition and reflect the types of ammunition fitted during the period. Should a vehicle take damage or run out of ammunition, it can return to base to be repaired and rearmed. We also plan to introduce armoured recovery vehicles for in-field rearming and retrieval for other knocked out vehicles. We are currently developing an armour rating system in order to realistically model the status quo of the battlefield at the time. A Tiger tank will be able to destroy a Sherman at 1km range, while the Shermans will have to coordinate and work together in order to close distance and hit a Tiger tank at close range from the flank or behind. To reflect the reality of the war, Shermans will be far more numerous and less costly to field. Additionally, a single Bazooka round will rarely outright destroy most vehicles. Players will have to be wise in how they use them in both positioning and proximity. Armour will only be able to be driven by a specified role. We have also simplified the crewing system to require two players to operate a vehicle, with optional passengers and commander positions. The reason we have done this is due to our total player count. In reality, five men were required to crew a Sherman tank. Therefore, if we want to field 3-5 Shermans, the US forces would be left with 25 men at most to fill the infantry, supply, artillery, commander and reconnaissance positions across a 2km frontline. By simplifying to 2 man crews, forces are able to deploy a proportionally accurate variety of vehicles. HOW BIG IS A PLATOON? Players are organised into groups of six, which are respectively called a Platoon or a Gruppe. We realise that real Platoons consist of many more men, however, these are representational formations. If we were to make real-sized Platoons we would only be able to field a single full Platoon. To give the sense of more men per unit, each Platoon has the ability to reinforce from their own player-deployed spawn point. WILL WE BE ABLE TO BUILD? Yes. We’re keen for players to be able to construct defences in order to capitalise on natural choke-points and fields of fire. The Engineer role will be able to erect barbed wire, tank traps, machine-gun nests and other emplacements. He’ll also be able to lay anti-tank and anti-personnel mine fields, as well as detect and mark enemy minefields. Obviously, an Engineer cannot carry battlefields worth of defences on his back. To construct them, he will have to have supplies delivered to the front line. It will be crucial to have steady and protected supply lines should you want to maintain a strong defensive line. WILL YOU CENSOR NAZI IMAGERY? Yes – but only in territories where the law states that we must. It is our goal to make a historically accurate game. As such, we will strive to capture the camouflage schemes, equipment, uniforms and weapons of each of the Wehrmacht and SS formations. IS HELL LET LOOSE A SINGLE COST? We are keen to support this game for an extended period (3-5 years minimum) and to consistently introduce more and more mechanics and a wide array of vehicles. We want to create a sandbox that facilitates the full spectrum of World War Two conflict. That includes additional forces and additional game-types. To do so, at present we plan to sell the game for a single, one-off purchase that includes all additional features and content. In order to sustain our revenue for long-term support of the game, we will also be creating one-time purchase expansions to include an additional campaign.